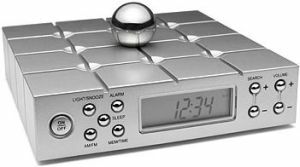 Have Fun with the Ball……wait a minute don’t take it otherwise I am talking about the latest Memory ball Clock radio. Actually the quilted look of the top is a grid and every intersection of lines is a pre set radio station. You can simply change stations by touching its magnetized ball and rolling it to some other place on this grid. It is capable of programming 18 preset stations 9 AM and 9 FM. It needs 2AA batteries to operate or you can simply plug into a wall socket. It looks impressive and costs $60, which makes it an ideal gift for all techno geeks.